The beginning of white settlement is not the beginning of deaf history in Australia. Deaf people are present in every culture and society, including indigenous Australian nations. Many Australian Aboriginal groups have had well-developed sign systems. These sign systems are used in situations where speaking is forbidden or difficult – such as mourning periods, hunting, or communication between different language groups. They may have also been used with Aboriginal deaf people. 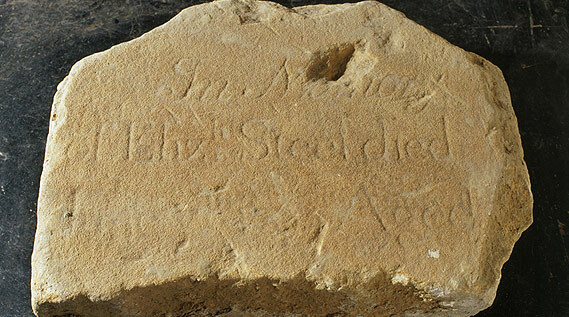 The emergence of deaf people in Colonial NSW began with convicts. Betty Steel arrived on the Second Fleet as a convict in 1790. She is the first recorded European-born deaf person to arrive in Australia. 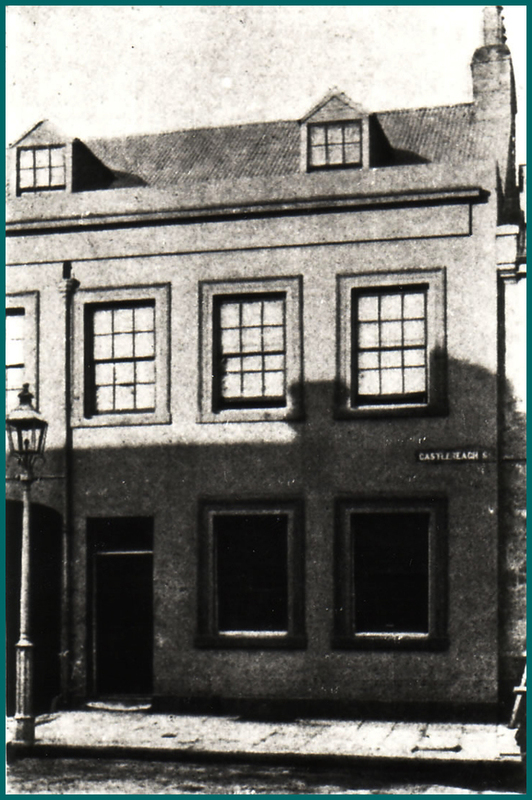 Thomas Pattison, a deaf Scot, arrived in 1858 and began teaching deaf children at his residence at 152 Liverpool St in Sydney on 22nd October 1860. He started with 11 deaf pupils. 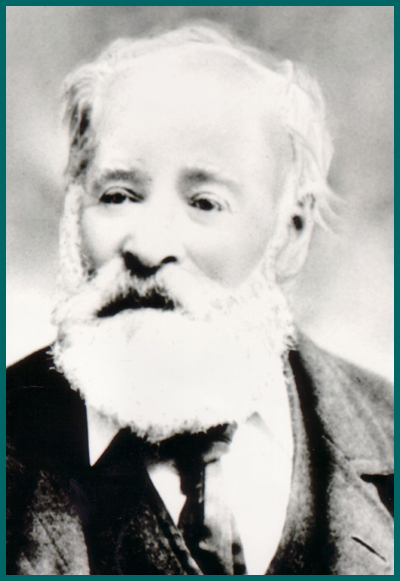 On 25th October 1860 Thomas Pattison also arranged a religious service for deaf people at his house. Photo courtesy of the Royal Institute for Deaf and Blind Children. 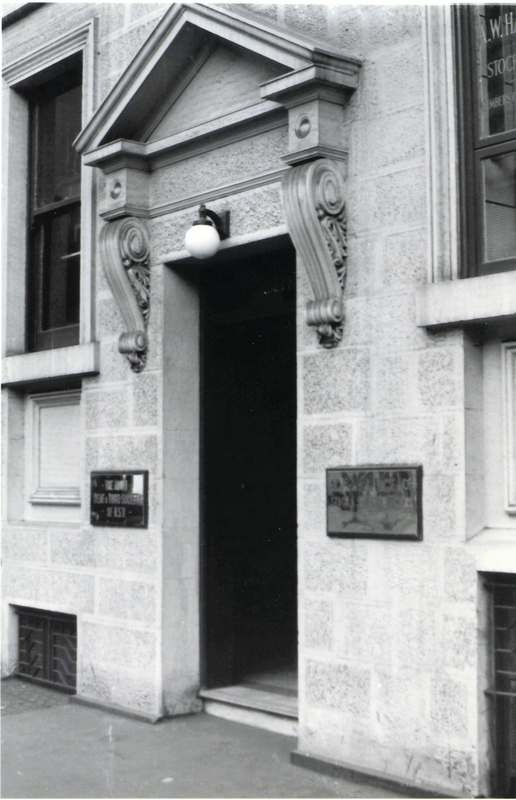 368 Castlereagh Street, the first Home of NSW Institution for the Deaf and Dumb. The numbers of deaf children steadily increased, leading to the beginnings of a Deaf community in NSW. A report in 1862 showed that there were over 50 deaf children in Sydney alone, and numbers grew in the second half of the nineteenth Century. Thomas Pattison’s school became the NSW Institution for the Deaf and Dumb and the Blind. This period saw the rise of leaders in the community such as Fletcher Booth, and allies of the Community such as Samuel Watson, the Superintendent of the Institution. A national Deaf Community began to develop through interstate contacts and travel. Deaf people gathered regularly in the school rooms of the original St Stephen’s Church in Rose Street Newtown between 1893 and 1902. The Adult Deaf Mute Association was responsible for managing the Adult Deaf Institute. Fletcher Booth's wife Laura is still remembered as a tireless worker. 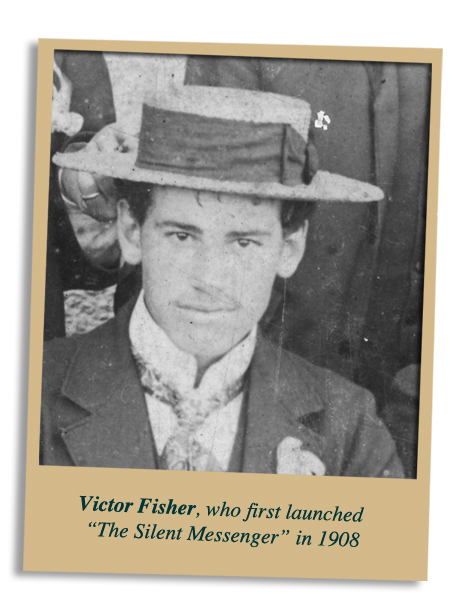 'The Silent Messenger' was first distributed in 1906. It was then renamed “The NSW Deaf Journal” from 1909, but lapsed after 1912. It was resurrected as “The Silent Messenger” once again from 1929. The Sydney Morning Herald, 21 October 1913, p. 10. 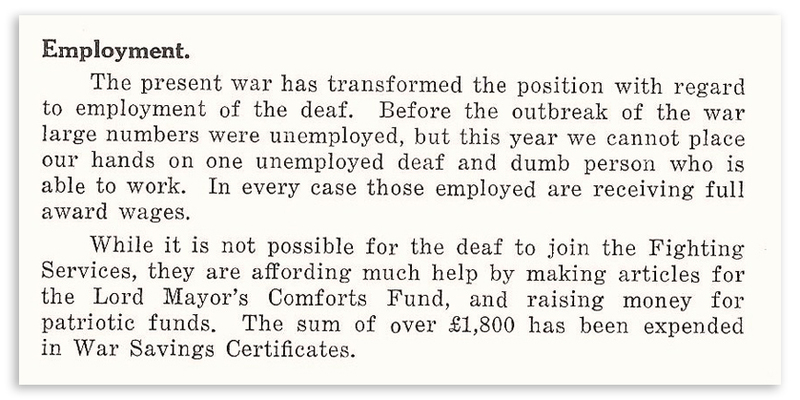 The turbulent years of the Great Depression were also revolutionary times in the Deaf Community of NSW. This was obvious when there was a breakaway organisation from the Deaf Society. 'The Deaf Advocate', was edited by Fletcher Booth and Ernest Quinnell and published the writings of radical deaf people from other Australian states as well. The story of the breakaway is a complex one of power struggles against a background of social unrest. The outbreak of World War II affected the Deaf Community in many ways. Deaf men were disqualified from active service in the army, but they took on many of the jobs at home which were previously held by hearing men. Deaf women also had broader employment opportunities. The Manpower program placed them in jobs to support the war effort, such as ammunition factories. 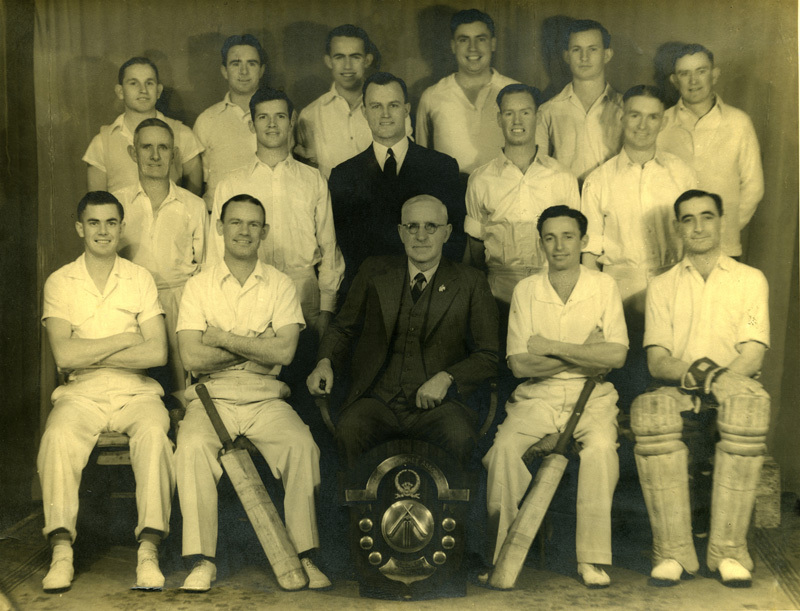 The social and sporting activities of the Deaf community were restricted during wartime (as they were for everyone else), but this difficult period gave many deaf people opportunities for work and greater independence. Annual Report, 1941-42, p. 4. Annual Report, 1941-42, p. 5. The Women’s Basketball team won the Premiership in 1944’. 'Gordon-Davis House’ was opened at Stanmore to provide housing for deaf people. It was a popular hostel for deaf people, both young and old. Ben Taylor, Henry Doherty, Ottomer Tozer, John Smith, Joe Schremb, George Goswell, Frank Fontana, Henry Hespe, Ron Tiyce and Les Burraston. Helen Todd (Goodsir), Betty Quinnell, Kay Beckman (Goswell), Lexie McLeod (Ravlich), Bonnie Jacobs, Betty Cassera (Bonser), Gillian Jankaus (Doherty), Madge Lyons, Fay Morris (Allen), Louise Vezgoff (West), Noleen Edwards (Waltl), Clara Cargill (Williams), Shirley Pinch (Page), Phyllis Smith, Pam Munson (Allen) and Neta Madden (Horley). James Laskie Holiday Home at Belmont near Newcastle was built by the Society to provide a holiday house for deaf people, and opened in early 1953. It was very popular with deaf people until it was sold in 1958. The Society’s Board helped to re-establish the Deaf General Committee. The Deaf General Committee had begun as the ‘Deaf Mute Committee’ in 1916, and changed its name to the ‘General Committee’ (1924) and then the ‘Deaf General Committee’ (1928). The Deaf General Committee was dissolved in 1938, re-formed in 1945, then lapsed in 1948 for several years until resurrected in 1953. It ran for another 31 years until 1986.
to provide further accommodation for deaf people. The Oral Division within the Society was formed to support the increasing number of deaf people who were educated in an oral environment. 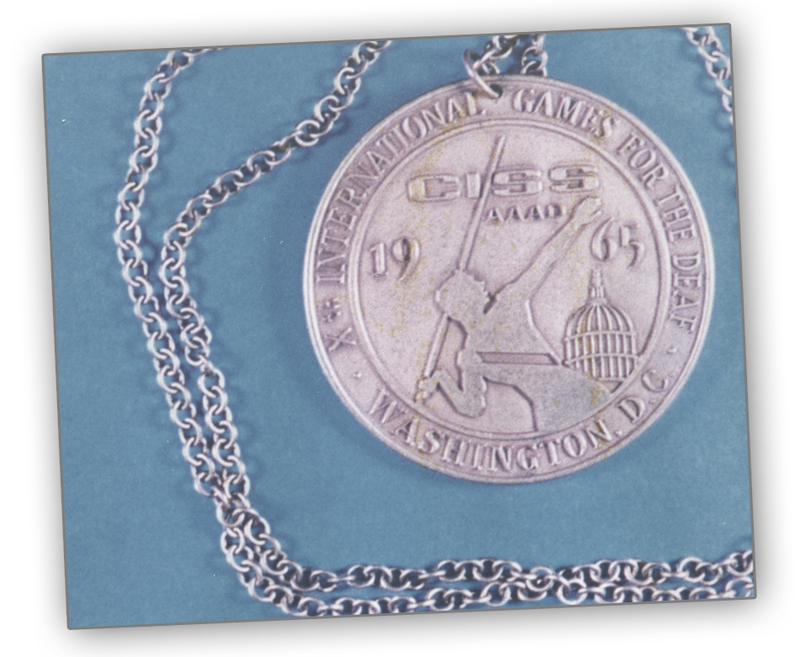 It ran parallel to the Deaf General Committee for many years and even had its own section in the Silent Messenger. 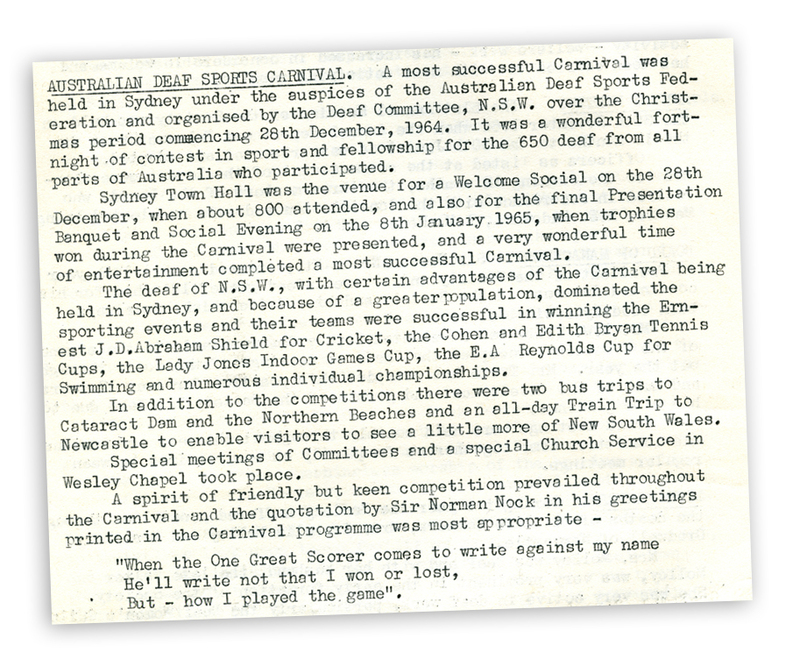 The Australian Deaf community had been holding interstate sports Carnivals since the early 20th Century. The event was re-named the ‘Australian Deaf Games’ in the early 1960s and the first one was held in Sydney. Australia was represented at the International Games for the Deaf (now known as the Deaflympics) for the first time. 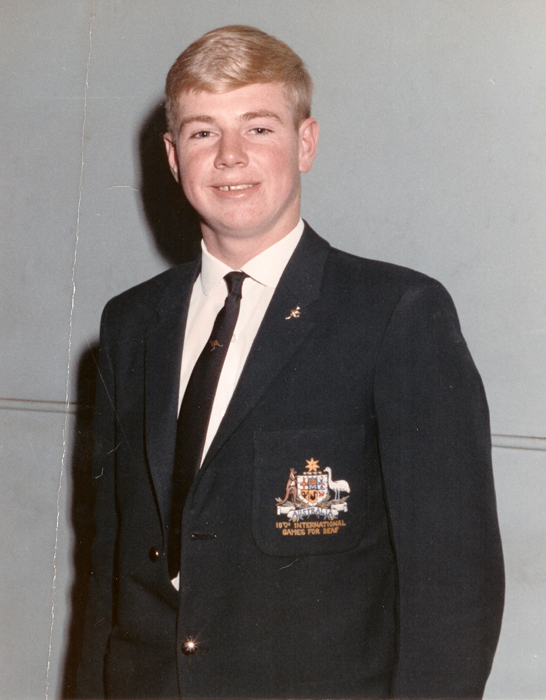 Two NSW competitors won medals – Barry Knapman won a gold medal for diving, and Jeff Went won a silver medal for swimming.